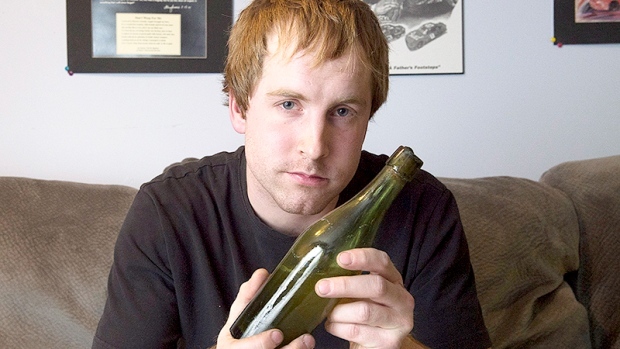 After being found at the bottom of the Halifax Harbour last year, scientists have cracked open a 125-year-old bottle of Alexander Keith's -- but so far reviews about its contents have been mixed. Amateur treasure hunter and scuba diver Jon Crouse pulled the half-filled, green glass bottle, with its cork still intact, from the silt in three-metre deep water in November. Crouse, who works at a Halifax-area warehouse, had found plenty of bottles while combing the depths of the Harbour, but nothing like this. "The buzz it created was kind of unprecedented," he told CTV Atlantic. "I didn't expect that." Naturally, Crouse was curious about the bottle's contents, and wondered if the more-than-century-old Keith's was still drinkable. While the treasure hunter was adamant that he didn't want to taste its contents, he and local bar owner Chris Reynolds sought the help of scientists at Dalhousie University to analyze the cloudy, straw-coloured liquid. Professor Andrew Macintosh, who specializes in fermentation research, said that the team looked at its density, colour, bitterness and pH levels, and the tests indicated the bottle was still filled with beer -- an India pale ale -- and not seawater. Macintosh said the beer shared similar characteristics with modern Keith's, including a 4.3 on the pH scale (beers typically range between four and five). It also registered a 15 on the International Bitterness Units scale, which Macintosh said is higher than what is found in many industrial, large-scale production lagers. With all scientific research out of the way, there was only one thing left to do: Cheers and drink up. Reynolds, who is the co-owner of the local craft beer bar Stillwell, was impressed. "It tasted surprisingly good, and surprisingly like beer," he said. Reynolds described the vintage brew as acidic and bitter, with some hints of cherry and oak. Meanwhile, Macintosh offered a starkly different assessment after he tried the ancient beer "for the sake of science." "You wouldn't want to drink any of it," he said. “It's terrible for a sample that's been sitting on the bottom of the Halifax Harbour for 100 years." He added that the brew had an "odd, meaty" flavour, with lighter tree fruit notes and a distinct bitterness. Macintosh also said it had a "very strong odour," that "wasn't altogether pleasant," like a burnt barrel with sulphur in it. Despite spending more than a century on the ocean floor, Reynolds said he wasn't concerned the beer would make him sick. "As any homebrewer that has brewed some really bad stuff can tell you: Just because it tastes and smells kind of bad doesn't mean it is going to kill you," he told CTV News Channel. "Basically, there's alcohol and a low enough pH that pathogens are kind of kept at bay." And while the 125-year-old Keith's may not have aged like fine wine, Reynolds is still happy he had a chance to taste it. "(It was) super, super cool -- just really great," he said. "I'll never get another chance to drink a beer quite this rare."